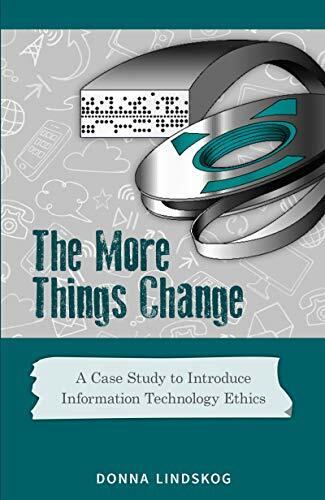 An ethical dilemma is described in this fictional excerpt from my book The More Things Change. In the 1980s, Carol is starting her new job as a programmer at MTS in Winnipeg, Manitoba, along with her two friends. 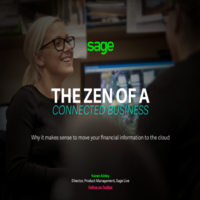 She soon faces many ethical dilemmas, such as what to do when management pressures employees to change private customer data. Ethics has never been on Carol’s radar before, but now she is beginning to see these issues all over the Information Technology department. Sam had fit in at the farm very well and had helped her Dad feed and water the cows in the morning before she even woke up. Apparently, he had some ranching experience and now her Dad and Mom were all over her about how serious the two of them were. Despite that, the visit had been good, the food had been wonderfully plentiful and fattening, and she had been outside enough that when she came back the office even the cubicles had been tolerable for a while. With only the winter to look forward to, Carol could not see much chance of getting outdoors anymore and the novelty of all these corridors that looked the same was wearing off after six months on the new job. She said as much to Jeremy and he offered to take her down to the PDP computer room in the basement for a change of pace. No windows and even more regulated air, but at least it was different surroundings. Jeremy had shown her special treatment ever since she had helped with the Operator Services install from Nortel. He had been the one to suggest she might help with the test plans and since she had done such a good job it had earned him some kudus with his boss. It had been a definite break from her work on the mainframe customer records systems, but she had not been back to see the (Programmed Data Processor) PDP’s since then. The telephone operator’s system they installed for testing had just stayed in and eventually had been switched over to become the production machine. Carol had cornered her boss Harold in his office one day and asked how a system could be chosen and installed without considering any others. Harold had given her a whole pep talk one day about how important it was to consider all the options before installing something new. The cost to change it out would preclude any other system replacing it even if it offered substantial improvements. Harold also trumpeted that MTS was a crown corporation, and we must consider how its one owner – the provincial government – would be perceived if the press ever reported on what we were doing. “But who made the choice?” Carol felt comfortable enough with Harold to push on for an answer. “The team made the choice. You were on that team. If you knew of some other option that should have been investigated, you should have spoken up. The company depends on you to insist on this stuff.” That was Harold’s last word on it, and Carol had been a little intimidated since she had not made the effort to research other options. She was just a programmer. Did she really have such big responsibilities? Would anyone have listened if she had escalated her concerns? That was all in the past, and this time when they entered the PDP room Jeremy took her past several of the PDP’s to a space near the back of the room. This room had the same raised floor as the mainframe computer room, but instead of rows of tape drives and then rows of disks and a long row of Central Processing Unit or CPU cabinets, this room was small groupings. 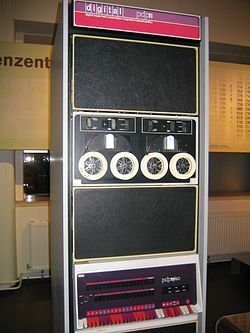 A CPU tower that was about the height of a cubical wall would be grouped with a similar size tape drive, a waist-high disk drive and a terminal sitting on a desk for a console. These were much smaller versions of the mainframe and so were called mini-computers. Carol noticed the purple and red color scheme on the plastic cover panels. Very modern looking! Some of the groupings had printers. Chapter 5 Question 27: Should Carol have investigated more options for the telephone operators? Should she have insisted that the team do something? When are we obliged to go along with the team and when are we accountable to speak up? Does it depend on our role? The More Things Change by Donna Lindskog is available on paperback and Kindle via Amazon.ca.